#KFRPod has dropped like a mighty oak hacked by a crazed Canadian Lumberjack! Host Scott Bowden and guest Howard Baum exchange cutting remarks as they slice through all the major angles that made the lumbering lug a maniacal money player in Memphis and the Sunshine State. Plus, you’ll gain insight from Jerry Jarrett, Dave Brown and Lance Russell into what made Leduc most memorable inside and outside the ring. So relax, heat up a bowl of fresh hot blood oats and enjoy—this is the KFR episode you’ve been axing for. You’d be crazy to miss it! 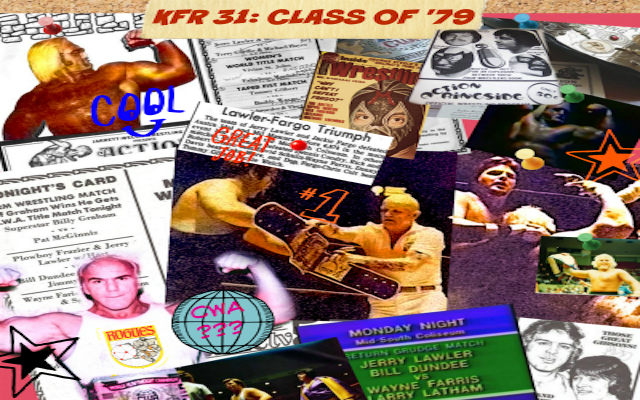 Episode 38 of the #KFRPod has dropped like a Nature Boy face flop! 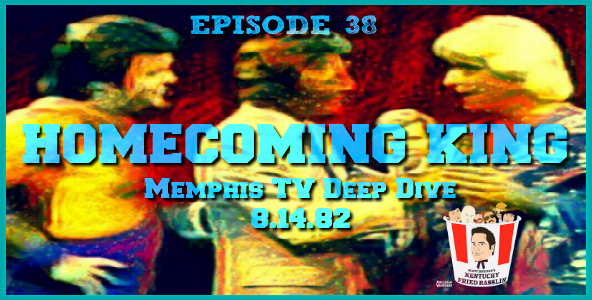 Scott Bowden & Howard Baum examine the 8.14.82 Memphis TV show as Ric Flair returns to his birthplace to defend the NWA World title vs. the King of the Country Jive, Jerry Lawler! Bowden explains why this is not only some of the best footage of the territory era but also possibly Lance Russell’s finest hour in the WMC-TV studio. Bowden also dispels some popular rumors about the day in question, praises Memphis promoter Jerry Jarrett’s booking of the finish, and explains why this was a good day for Jimmy Hart and quite possibly the greatest day of ringside photographer Jimmy Cornette, who drove up from Louisville to capture all the action. Plus, you’ll learn why Ric Flair never returned for his payoff and the promotion’s decision to go with Nick Bockwinkel instead of the Nature Boy for future World title programs with the King of Memphis. All this, plus a look at the unique dynamics of the Dutch Mantell vs. Bill Dundee angle on the same Saturday, and much more. 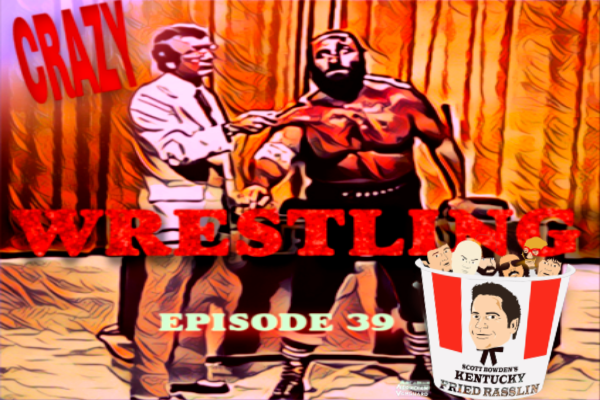 Freak out—it’s a Merry Macho Crispy edition of the KFR Podcast with host Scott Bowden guiding his sleigh down memory lane to the biggest card of Memphis wrestling in 1983—Dec. 5 to be exact. The originally scheduled main event saw the Road Warriors make their post-apocolyptic debut in the territory in a rumble for the ages vs the Fabulous Ones—with more potatoes served than all area KFCs combined. But it was the late addition to the main-event spot (along with smuggled booze) that had the Coliseum buzzing: ICW outlaw Randy “Macho Man” Savage finally invades Jerry “The Queen” Lawler’s kingdom, bringing his own brand of madness to Memphis for the first time under Jarrett’s banner. Bowden was in attendance that night along with a little more than 8,000 other stinkin’ rednecks—not a bad house coming off the slow-dying feud between the King and Kaufman but not even close to the anticipated sellout. Together with longtime fan John Keating and ICW co-founder “Hustler” Rip Rogers, Bowden speculates as to why the program between Macho and Kingfish fizzled after three weeks in Memphis but thrived in Louisville, Lexington and the surrounding areas. All this and classic Savage audio make this a Merry Macho Crispy season to remember. So break out the confetti ’cause we’re doing the thing! 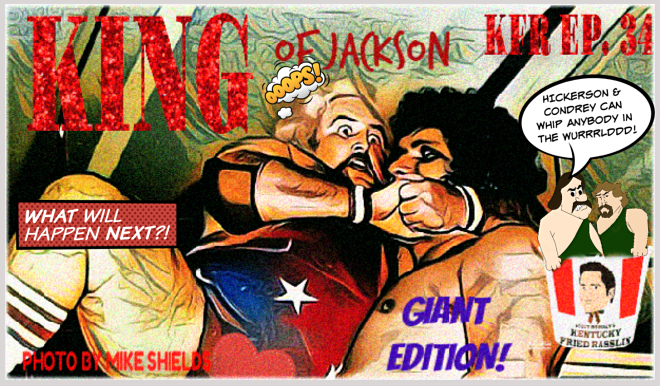 KFR Pod #35 has dropped like Ricky Morton’s head through a table after a Macho Piledriver! Host Scott Bowden goes behind the camera to chat with longtime (and now retired) WMC-TV 5 engineer Ken Parnell, who reveals the crazy energy and the wild-and-wooly inner workings of the Memphis TV show in its heyday. Ken recalls his rookie year of 1981, which resulted in some of the most entertaining Memphis TVs in history thanks to the red-hot feud between Jerry Lawler and the All the King’s Men vs. Jimmy Hart’s nefarious First Family. Ken will also explain the details behind his ill-advised detour down Badstreet USA where he lost the Freebird version of Rock, Paper, Scissors in August 1985 as part of a bloody-good angle at the Mid-South Coliseum. Plus, Ken breaks down what made Memphis wrestling so special and his thoughts on the show’s TV format that was as loose and flexible as any arena rat back in the day and just as action-packed. Not only does Ken provide a unique perspective of the show working for both the station and the promotion, but he also shares inside stories such as a Macho Man promo that nearly made Ken quit the business and how that led to he and Randy Savage eventually becoming good friends. All this and more on an extra-crispy, not-so-late KFR Episode 35! Scott Bowden reunites with Jeannie Clarke for the first time since meeting in the hallways of WMC-TV 5 prior to live Memphis TV in spring ’91, when the KFR host was breaking into the biz as a snot-nosed 19-year-old referee. The USWA alumni talk about the stunning career of another future star Scott met that day, Steve Austin, as well as her WCW run and eventual marriage to Austin and her little-known past as the former Mrs. Billy Jack Haynes. Other topics include the booking minds of Chris Adams, Jerry Jarrett, Eddie Gilbert and Eric Embry and how they helped shaped her career as well as Austin’s. Jeannie speaks candidly about the highs of achieving wrestling stardom with Stone Cold as well as the extreme lows of nearly losing it all when her dreams shattered while her husband’s star continued to shine as bright as the Lone Star State. All this as well as rare classic audio from the WHBQ Memphis days featuring a heel Danny Hodge subtly threatening to stretch Jerry Lawler in Jonesboro during an interview with Lance Russell in early 1975—you won’t hear this promo anywhere else but on KFR Episode 33! 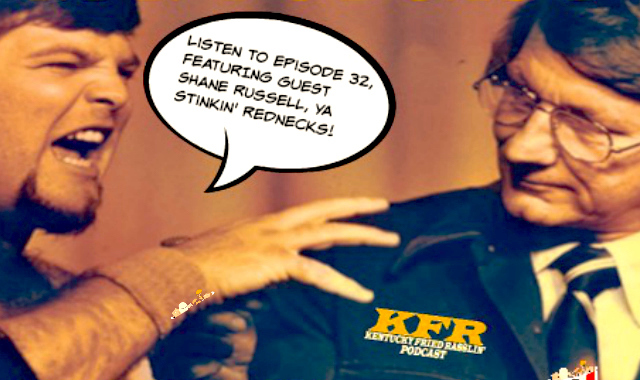 Yellow again, everybody, and welcome to another BIG DAY of the KFR podcast, as Scott Bowden and Brian Last welcome Shane Russell, son of legendary Memphis Wrestling broadcast Lance Russell. Shane shares his favorite memories both as a huge wrestling fan and as the son of the most iconic personality in Memphis broadcasting history. Shane shares memories of tagging along with his father for live broadcasts at WHBQ and later at WMC-TV and discusses his personal favorite Lance Russell moments, both on camera and at home. Shane also explains Lance’s decision to leave WHBQ and promoter Nick Gulas for WMC-TV and Jerry Jarrett, and why this led to some spirited discussions at the Russell home. Shane also offer insights into the special relationship between his dad and Jerry Lawler and details what it was like being known as “Banana Nose Jr.” by his classmates in Memphis growing up. All this, plus classic Lance Russell audio make this a show you don’t dare miss, partner! KFR host Scott Bowden has returned from Parts Unknown armed with evidence he claims will be the smoking gun in the Mil Mascaras Monday Night Mystery! Bowden not only looks back at the night in question of January 29, 1979, but also examines every single card he attended that year as a young fan at the Mid-South Coliseum. Bowden shares his memories of a young Terry “the Hulk” Boulder, Robert Fuller’s booking and ascension near the top of Memphis cards, the emergence and abrupt departure of the Freebirds, thoughts on what made the Tupelo, Miss. concession stand brawl work, the amazing promos of Jackie Fargo and the outlandish antics of Roughhouse Fargo, fresh out of the nuthouse in nearby Bolivar, Tenn., and witnessing his first AWA World title match in August and his first “World” title change in Memphis. Bowden and host The Great Brian Last also talk Moolah, Jarrett, Idol, and rare Memphis appearances by Crusher Blackwell…and Tom Snyder?! 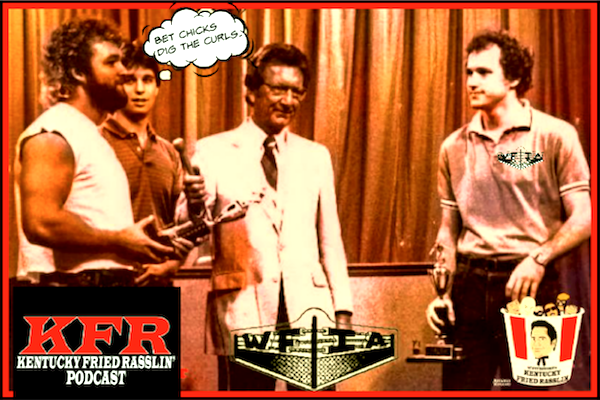 All this and more on Episode 31, “Class of ’79,” on the KFR Podcast. Host Scott Bowden is right along ringside for Episode 30 to honor four professional wrestlers who experienced varying degrees of success in the Memphis territory but nonetheless made an indelible impact years before their recent passings: Jim Jamieson, Jim Neidhart, Brickhouse Brown and Chris Champion. 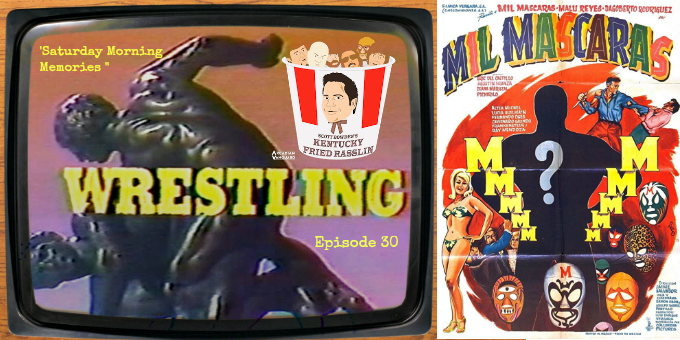 Bowden and co-host The Great Brian Last will also discuss the recent revelations in the Mil Mascaras Monday Night Mystery, including reactions from the fans and longtime promoter Jerry Jarrett.